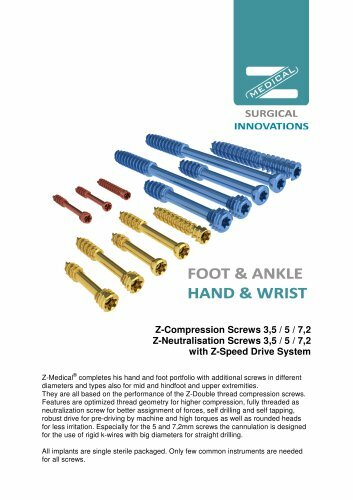 Z-Compression Screws 3,5 / 5 / 7,2 Z-Neutralisation Screws 3,5 / 5 / 7,2 with Z-Speed Drive System Z-Medical® completes his hand and foot portfolio with additional screws in different diameters and types also for mid and hindfoot and upper extremities. They are all based on the performance of the Z-Double thread compression screws. Features are optimized thread geometry for higher compression, fully threaded as neutralization screw for better assignment of forces, self drilling and self tapping, robust drive for pre-driving by machine and high torques as well as rounded heads for less irritation. Especially for the 5 and 7,2mm screws the cannulation is designed for the use of rigid k-wires with big diameters for straight drilling. All implants are single sterile packaged. Only few common instruments are needed for all screws.